The medial collateral ligament, or MCL, is a thick, strong ligament on the inside of the knee. An MCL tear is common knee injury suffered by athletes who play contact and collision sports, such as football and soccer. 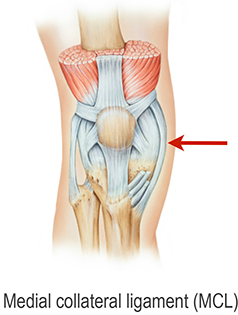 The typical mechanism of injury for an MCL tear involves a valgus stress. An example of this type of stress is when the athlete’s foot is planted on the ground and he is ht on the outside of the knee. In this mechanism, the ankle is forced laterally, or toward the outside of the body, while the knee goes medially, or toward the inside of the body. This event injures the ligament on the inside of the knee. The athlete will often describe feeling a pop and having sharp pain on the inside of his knee. The injury involves various degrees of severity, ranging from sprains of the ligament to partial tears to complete tears. Most commonly the MCL is sprained, which is a stretch to the ligament. More severe stress to the ligament can partially tear the MCL or cause a complete rupture. The ligament can also be injured in different locations, such as at the end of the femur (thigh bone), at the joint line, or at the top of the tibia (shin bone). Different degrees of severity and different locations of injury to the MCL can not only affect treatment but also the time it takes the athlete to return to sports. Fortunately the treatment for most MCL injuries is nonoperative. It is important to ensure that there are no other injuries that occurred, such as anterior cruciate ligament (ACL) tears, posterior cruciate ligament (PCL) tears, or meniscal tears. For that reason, it is usually a good idea to consult an orthopaedic sports medicine specialist, and sometimes an MRI is performed. If it is an isolated MCL injury, the treatment is almost always nonoperative. The orthopaedic surgeon will likely place the athlete in a hinged knee brace that allows flexion and extension of the knee but prevents side-to-side motion, and in particular valgus stress. In the brace, the athlete can usually walk and perform normal activities. As the pain decreases and the athlete is able to perform more activity, he or she will be progressed through a functional program including running and then side-to-side and cutting drills prior to being cleared to return to play. Platelet-Rich Plasma can be another treatment option to explore. How can I fully recover from an MCL injury? What is the impact of the injuries to Steph Curry, Chris Paul and Blake Griffin?